Dana Meadows (58) — tall, graying, very opinionated, restless, energetic, always starting more projects than she can finish, wildly idealistic and visionary, generally cheerful except when angry at the state of the world. Teaches part time at Dartmouth, writes stuff, tries to direct the Sustainability Institute, knits socks incessantly (hey, it makes long community meetings tolerable! ), plays classical music on the piano but never practices. Fills up the whole damn place with books. 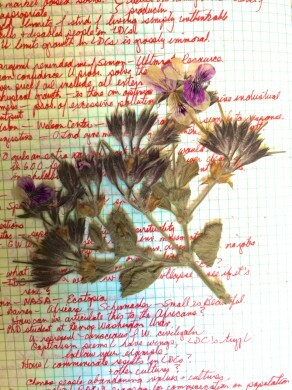 A peek inside Dana’s journal reveals brilliant writing as well as dried flowers from her garden. This is how Donella Meadows characterizes herself in one of her last Dear Folks letters as she paints a picture of the new Cobb Hill community. I was struck by this description because it made me think about how I would sum up this woman’s personhood after combing through her journal entries, letters to family and friends, scholarly literature, newspaper articles, radio show appearances, footage of taped speeches, and more for the past few months. I have never met Dana, and yet I am deeply interested not just in the content of her message, but in trying to make sense of her as a human. She was clearly a genius (though she disliked that term for herself) and a visionary, but her mind was only one of an entire arsenal of tools that allowed her to deeply impact so many people around her (and far beyond). Dana’s legacy should not just live on in her timeless wisdom, but also in learning from the qualities that she was able to harness to become such an exceptional communicator and leader. So, in trying to discern what sets Dana apart from the rest, I have drawn my own conclusions about how this extraordinary human changed over time, the themes in her persona and writing that stayed constant, and how she touched the lives of the people around her. There were a few notable changes in Dana’s writing over the years. It’s amazing to read her journal entries from her time traveling throughout Turkey, Iran, Afghanistan, Pakistan, India, and Sri Lanka; she was fresh out of a PhD program at Harvard and still fiercely believed that “science could solve all problems.” These journal entries show the clear evolution of Dana the avid scientist to Dana the humanist, utterly obsessed with poverty, development, how people grew their crops and built their houses and raised their children, etc. While Dana utilized her scientific background as a foundation for her groundbreaking systems work throughout the rest of her life, her humanistic perspective is what really shone through in her writing for the next several decades. Dana also became increasingly political in her writing over time. While she began her journalist career proclaiming the importance of love and compassion and called for a world with more of these qualities, through the years she seemed to become more and more frustrated with the systemic barriers that reason, genuineness, love and trust faced in current political and economic environments. Dana became more urgent in advocating for a new political party, a new political system, a new economy, etc. For the most part, though, Dana’s message and persona seemed really very constant. For one, there was much I came to rely on in the way of her Dear Folks letters (the messages she sent to a large network of family and friends each month). The first half was generally dedicated to the goings-on at the farm. Every springtime, she would give detailed, giddy accounts of the lambs birthing. Each summer, she would pen a love note to the incredible bounties that the farm had to offer, raving about the amazing, fresh-as-can-be salads she and her housemates savored each day. Come September, she would come back from a Balaton meeting and, time and time again, express her frustration that she would never properly be able to express on paper what those conferences meant to her, and yet she would try her best to articulate how those annual gatherings- their lectures, workshops, walks, sing-a-longs, etc. were the high point of the year and fueled her for months to come. Later that autumn, Dana would lament about being torn away from her farm for business travel during the peak of New England foliage and the squash bounty, when all she wanted to do was bake and putz around her home. Each holiday season, without fail, a detailed account of the incredible meals she would share with family and friends would be accompanied by a rant against consumerism and the commercialization of Christmas. In spite of all we have learned about our earth, we are still tremendously ignorant… Given how little we know, full speed ahead is the worst policy we could adopt. The second worst would be to stop in our tracks. The right way to go, when you’re going in ignorance, is slowly, with eyes and ears and satellites cocked for signs of trouble, always willing to learn and try a new way forward. Dana and I had a special relationship. She was at various times my teacher, mentor, colleague, collaborator, debate partner, and cheerleader. She was a pillar to me, a beacon, a guiding star. But I hasten to add that I am by no means unique in this. There are literally hundreds of people who would describe their relationship with Dana in a similarly special way. One of Dana’s many great gifts was her skill at the art of friendship. She leaves behind an extraordinary network of friends, from her current college students to senior scientists and decision makers. My guess is that this network, this enormous web of human relationships, will prove to be her most powerful legacy. Dana is probably one of few PhD scientists who prescribed love as a solution to a myriad of the world’s ills, but she was not afraid to put rationality and logic on the back burner to focus on the human qualities that she believed were the keys to a brighter future. Compassion is the foundation of all her writing (even the angry writing). I think I get a sense of the loving smile and warmth Dana exudes in this amazing speech on visioning (so very worth the watch- it gave me chills and brought tears to my eyes!). I kept track of all of the times I came across Dana’s irrepressible, action-based optimism in her writing or the musings of friends, and it led to an extremely lengthy list. 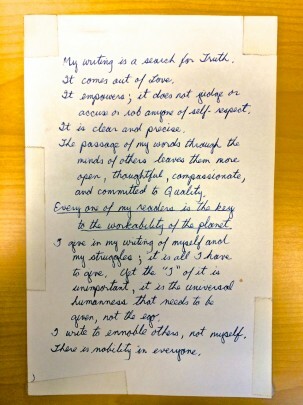 She had such faith in human virtue and the capacity of humanity to utilize its “technological power, knowledge, organization, and riches… to support all people sustainably.” Her columns and scholarly literature wrestled with many daunting problems but always left readers with a menu of systems-based solutions that seemed doable and enticing. She had her moments of frustration and anger over the years, but they were the anomaly, and always led to an apology letter and immense introspection. In Dana’s eyes, every situation- even her battle with cancer- became an opportunity for adventure and improvement. I have never felt so motivated and inspired as these past few months, immersed in her thoughts! John D. Sterman hits the nail on the head here. After an evening with her you not only felt it was possible to create a sustainable world, you wanted to be a part of it, and you came away with more energy than ever to work towards it. That joy, that faith in the essential goodness of people, was infectious. Dana was undoubtedly a pioneer. She challenged preexisting ideas (of others and herself), offered up new paradigms, and trail-blazed new fields of study. She conceptualized a better world by closing her eyes and dreaming up what that would actually look like. By never letting go of (or perhaps working to rekindle) her inner-child and her imagination in its purest, most honest state, Dana was a revolutionary. A lot of us stuck a “Think Globally, Act Locally” sticker on our bumper- and kept driving. Dana lived it. She walked her talk better than anyone I have ever known- she was as conscientious about the soil she worked on her organic farm as her path-breaking global computer projects and thoughtful newspaper columns. Nowhere was this more apparent to me than in the correspondences between Dana and her social circle, where the same page could be filled with paragraphs about both canning beans and her vision for a world without hunger. There is no doubt in my mind that Dana was a brilliant pioneer, but just as much of her time and energy (if not more) was dedicated to getting her hands dirty creating the world she wanted for all, farming and fostering local (and global) community and speaking from a place of truth and love on a daily basis. Kylie Flanagan, the 2014 summer intern for the Donella Meadows Institute, will soon be senior at Dartmouth College, where she majors in Geography and minors in Environmental Studies.